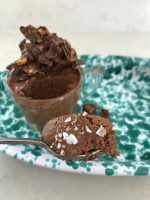 These gently spiced chocolate mousse pots are one of the easiest of make-ahead desserts. They are gluten and dairy free too so they cater for pretty much every guest, children too. 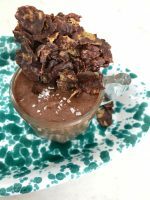 They are inspired by the flavours of Mexican hot chocolate but you can make them with or without spice. I love them so much that I made them for my 40th birthday party a few months back. Everyone thought I was a bit daft to cook for my own party but I pulled out all my make-ahead recipes so that I could eat some of my favourite things (yep I’m a control freak) but still enjoy every bit of the party. Serve them in teacups or mini jars so there is no portioning out at the last minute. The mousse can be made up to 3 days in advance. You can also freeze them and eat them from frozen. 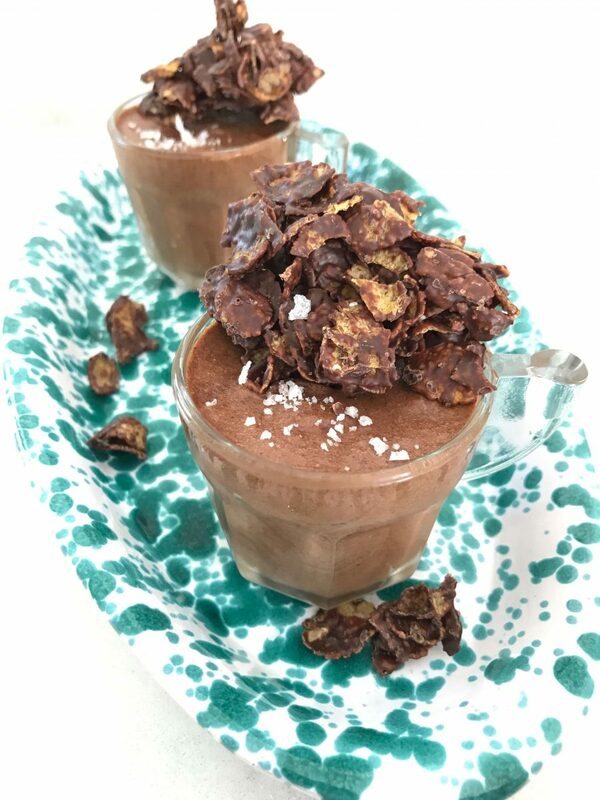 To contrast the soft texture of the mousse, I make little chocolate and sea salt rice crispie or cornflake cakes (or chocolate sea salt pretzels) to serve with them. To make the crispie cakes, melt dark or milk chocolate – about 100g. Mix with 100g rice crispies or corn flakes until the flakes are coated. Scrape onto a silicone sheet or a piece of foil and flatten into a 1cm slab. Sprinkle sea salt flakes and orange zest over the wet chocolate and leave to set. This will set in about an hour at room temperature. Break the crispie bar off into jagged chunks and use these chunks to dunk in the mousse. Any broken bits or leftovers will stay fresh in an airtight container for a few days and are lovely on ice cream or with a cup of tea. Break up the chocolate into small pieces. This is best done by gently bashing the bar against your worktop before unwrapping it. Add the salt, cinnamon and dried chili flakes to the chocolate and stir to combine. Set chocolate aside to cool. Separate egg yolks from the whites, putting egg whites into one bowl and the yolks to a medium-sized mixing bowl. I do this by cracking the egg and tipping the yolk from one half of the shell to the other over a small bowl, letting the egg white fall into the bowl and keeping the yolk in the shell. If you get any bits of yolk in with the white, the white won’t whisk up. So give yourself a safety net by separating the eggs over a small bowl then transferring the white from each egg to the main bowl – that way if you get yolk in one egg white you don’t waste all the other egg whites. Whisk the egg whites on high with a hand mixer or stand mixer until they form soft peaks – about 4 minutes. Add the honey and orange zest or orange blossom water to the bowl of egg yolks. Whisk until they are pale and creamy- around 4 -6 minutes on high. Use a silicone spatula to scrape the chocolate mixture into the egg yolk honey mixture. Fold together gently until combined. Fold the egg whites into chocolate mixture. Start by adding about 1/3 of the egg white. Then continue to fold in the remaining egg whites and stir gently until combined. You don’t want any white lumps left, but you also want to make sure you don’t knock all that hard-earned air out of the mixture. Spoon the mousse into teacups or jars, wipe any splodges so that you have a neat edge, then place on a tray and cover the whole thing with cling film before chilling for three hours or overnight. Serve chilled with a sprinkle of sea salt flakes and a crispy dunker, or go the whole hog and add a small spoonful of creme fraiche. The tartness and creaminess of the cream balances out the chocolate really well. Find more recipes for chocolate, desserts and eggs here.